Mismatched bistro chairs, ceiling fans and a web of electrical overhead light cables all add to the ambience of this 'Bombay cafe'. 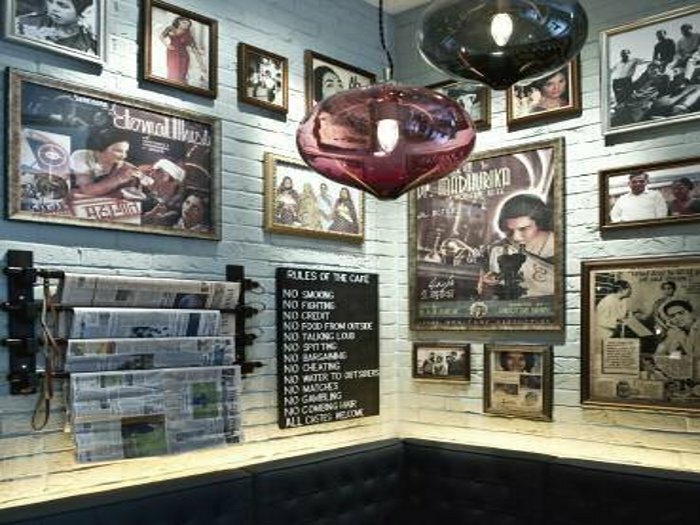 ‘Our approach was clear from the start: no stereotypes and no clichés’, says interior and product designer Afroditi Krassa of her scheme for Dishoom, a new ‘Bombay Cafe’ in London’s West End. 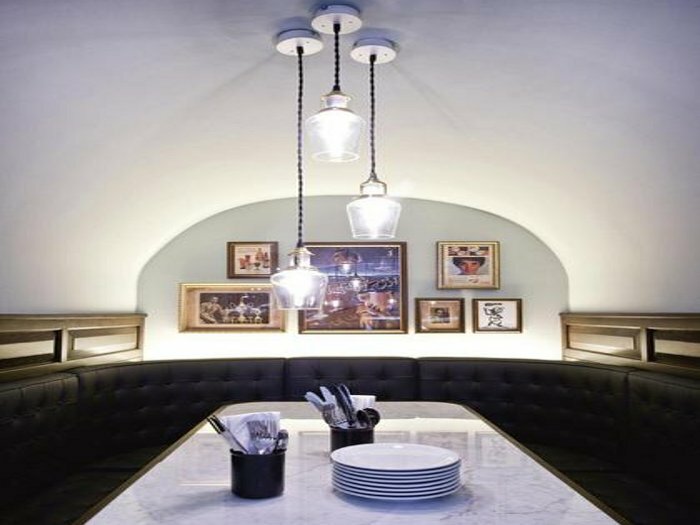 Dishoom’s enthusiastic and effusive proprietor, Shamil Thakrar, had seen Krassa’s work for the Itsu chain of sushi restaurants and admired her original interpretation of Japanese food culture. ‘We really liked her method of approaching things completely fresh – from the ground up,’ says Thakrar. Curry houses have been a beloved part of British culture since the Seventies, but Thakrar was keen to represent the relationship between Britain and India in a way that felt more original – and that better suited the restaurant’s location. Several months of research and a few trips to Bombay later, the Dishoom identity was born. The interior scheme takes elements from traditional Irani cafes (all-day eating places set up by Iranian immigrants to India), street stalls and other informal eateries. Everything in the restaurant references the heyday of the Irani cafe, from the Thirties to the Sixties. 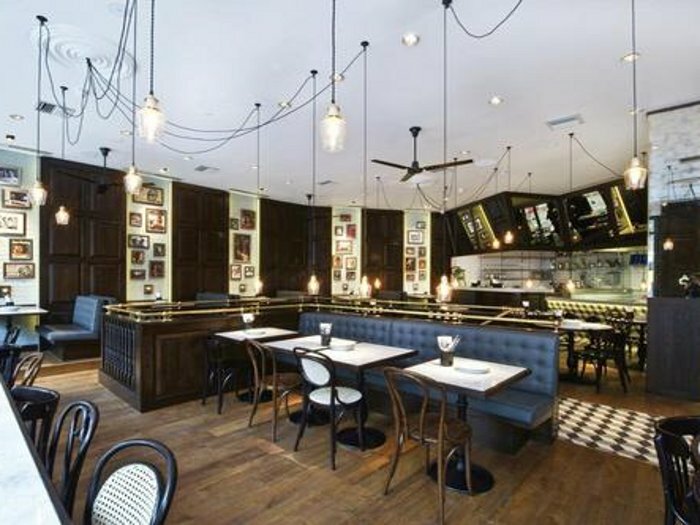 Mismatched bistro chairs and ceiling fans were chosen, Krassa says, to ‘transport diners to a more exotic place and time’, and solid-oak panels, vintage mirrors and pendant lights hanging from a web of black cables say retro chic. The shade of blue used on the walls is a close approximation of the colour most often used in the Irani cafes, booth seats have been upholstered in grey-blue leather, and the floor has a classic black-and-white check, but there’s plenty of colour in the retro Bombay portraiture and Sixties pop imagery, which adorns the walls. ‘We worked really hard on the artwork to get the look right,’ says Thakrar. Many of the portraits are of Thakrar’s own extended family.